To cure the sudden and unexpected urge for progressive which overcame me the last couple of weeks, I randomly reached into the pile of death metal languishing on my desk only to pluck out Mordbrand’s Necropsychotic. And some curing this album did with its thick, warmer sounding and sloppy old-school Swedish death metal. 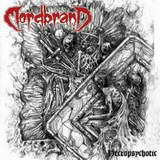 Meaning ‘arson’ in Swedish, Mordbrand not necessarily set the house on fire with their short album, but they pound those riffs with a hint of playfulness (Graveyard Revisited), shift to slower doomy passages when the need be and go for face-ripping thrash (Deathbound). Yet the band is the most engaging when they churn a melodic cauldron on Skarseld (Return to the Unholy) or throw out less polished, but fatter and more resonant, Amon Amarth-like tremolo waves in The Fall of Flesh. Every time the band pulls the tempo back, however, they become a lot more Autopsy-like savage sounding crew (witnessed by the ends of Graveyard Revisited and The Fall of Flesh), with melody, again, not being a foreign virtue for Mordbrand as the closer Deliverance indicates. One of the more experienced trio members is their vocalist Per Boder, who sang for God Macabre. He has an interesting manner of delivering his growls. Not overly low and bottom scraping, instead he is cavernous, partly withdrawn and tormented, almost vulnerable in a sense. This style suits him very well, when the projection of being given up on Deliverance pushes the desperation all the way to the front. Not as icily grating as Dismember or Entombed, Mordbrand still has guitars distorted and tubed out enough to bring out the vestiges of the Swedish death metal gone past. I needed an antidote for the things polished and pretty and Necropsychotic delivered. Perhaps it came simply at the right time, but short as it is, it satisfied the need, and hit the right spot.